The continent of Africa is home to many unique regional styles of traditional music. The common characteristic of them all is their inseparable integration with the daily lives of Africans. In African culture, music is not an abstract art form that must be studied in school. It is a common activity that everyone does together during the ordinary moments and extraordinary rituals of each day. In the publication Africa: Journal of the International African Institute (Vol. 14, No. 6, pp. 340-342), researcher Fela Sowande notes that 70% of traditional African music deals with ethical subjects while the rest of its subject matter addresses topics of ordinary life. Geography greatly defines African music. Region, proximity to other cultures, and the impact of colonialism all influence traditional African sounds. North Africa, or the Maghreb, is a region that includes the countries of Morocco, Algeria, Tunisia, Libya and Egypt. North African music blends the traditions of its indigenous peoples with Turkish, Arabic and Western elements. Byzantine, Indian and Persian musical forms influenced early Arabic music, and these were influenced themselves by the earlier Greek, Semitic and Egyptian cultures of music. The Egyptian culture is an ancient one and music has been a part of it from the beginning. Egyptian mythology credits the god Thoth with the invention of music. The Egyptian god Osiris then utilized music as a tool while civilizing the world. Evidence shows that ancient Egyptian musicians played early forms of flutes, harps and clarinets. The Berbers are a very prominent ethnic group found in North Africa. Having resided in this region for up to 5,000 years, the Berbers share a comparable influence to the Egyptians in North Africa. Their musical traditions are heavily influential in Moroccan music and the Kabyle and Chaoui music of Algeria. Berber music is defined by its oral folk traditions as well as pentatonic scales and traditional African rhythms. The tonal system or maqam. The rhythmic patterns or awzan. The musical instruments, which contain a standardized tone system and are played with standardized techniques. The social contexts, for example urban, rural or Bedouin. The Arab music mentality, particularly the predominance of vocal music and the tendency towards small instrument ensembles. Eastern African music has been said to celebrate "a whole way of life - cattle, warriors, elders, girlfriends, the self, hunting and raiding... weddings, funerals, and children who cannot sleep." Eastern Africans, and particularly the Indian Ocean islands, look even further east for their musical influences. Indian, Polynesian, and Indonesian music traditions can be heard in the music indigenous to this region. East Africa also borrows inspiration from its neighbors. There are both Middle Eastern and sub-Saharan African music styles blended into traditional East African music. This region's music is often paired with traditional dance. For example, in Uganda the music and dance is joined together by a sense of rhythm, with the coupled art forms being closely related to religion, spirituality and ancestral worship. The music from Sub-Saharan Africa is the African music people tend to be the most familiar with. Sub-Saharan music is characterized by its complex rhythms and polyrhythmic percussive sounds, using a basic rhythm structure known as cross-beat. 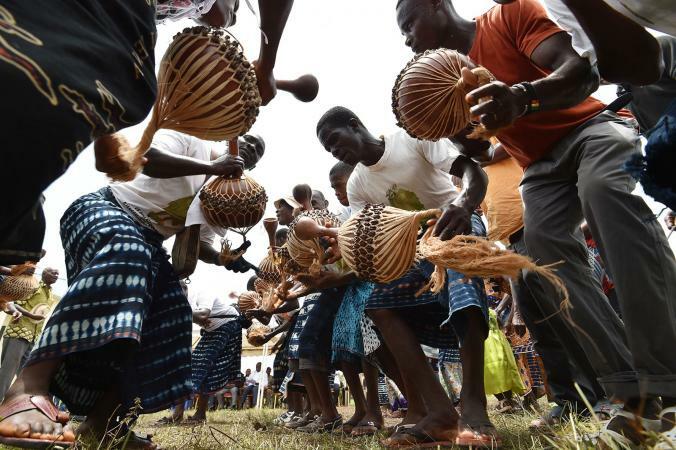 This rhythmic music is a melting pot of musical traditions traded among African neighbors and the European colonial forces that occupied these countries. The traditional music from Sub-Saharan Africa was carried to North America by slaves, who were predominantly from this region. Traditional Caribbean music, passed along via the slave trade, both greatly impacted and was impacted by this region's sound. Musical genres, such as the styles in Nigeria, developed during Muslim holidays as pilgrims returned from Mecca. One example is the waka, in which the women sing while rhythms are played on beaten tin disks with metal rings attached. Sub-Saharan Africa has one of the longest running and most vibrant music cultures in the world. Traditional music in this region is often not strictly for entertainment purposes. Rather, music is tied to events. There are traditional songs that function like soundtracks to major happenings and activities, including hunting, childbirth, marriage, political elections, honoring ancestors and warding off evil spirits. There are often traditional dances to accompany the songs. South African traditional music shares its story with the musical traditions of other African regions. It was created from the intermingling of native ideas and those from the outside world. Slavery also plays a prominent role in these traditions, as slave orchestras were once forced to play Western music and, thus, began incorporating their own forms and themes into it. On a continent dominated by diversity, South Africa may be the most musically diverse region. With the earliest inhabitants being ancestors of the Zulu, Xhosa, Sotho, Tsonga, Tswana, and Venda peoples, and later South Africans sharing the region with the Dutch, French, Germans, English, Indian, and Chinese, there is a mammoth well of music from which South Africans draw their traditions. The effects of apartheid are also apparent on the musical heritage. For those constricted by these oppressive laws, music was a major outlet to express their troubles. Vocal and choral themes dominate the South African musical tradition. More specifically, most South African music features a call-and-response narrative. The Zulu tribal tradition is one of the most well-known in South African music. Apala - Originating in Nigeria, this is percussion-based, spoken word music. Gnawa - This music can be traced back to the 16th century. It is now associated with Morocco but it originated with slaves in Mali. Isicathamiya - This a cappella, call-and-response music style has its roots in Zulu tradition. It has been adopted by modern popular musicians, especially in South Africa, but its roots run much deeper. Kwela - Kwela is very simple music featuring a tin whistle. It originated in South Africa. Wassoulou - Coming from Mali, Wassoulou has strong ties to Arabic music. It is traditionally performed by women using two traditional instruments: the karinyang and fle. Tuareg - Tuareg is named for the tribe of people who created it. It combines call-and-response vocals with stringed instruments. Membranophones - Drums with membranes stretched over a solid shell, such as a bongo, conga or djembe. Chordophones - Stringed instruments, such as koras or zithers. Aerophones - Wind instruments, such as flutes or trumpets, made out of reeds or animal horns. Idiophones - Resonant solids, such as xylophones and various rattles and shakers. Other Percussion - These can include rain sticks, bells and even a human body foot stomping and hand clapping. With its history and diversity, African traditional music holds influence over music in other parts of the world. The society-altering genres of blues and jazz can be said to have descended directly from African traditions, along with surprising genres like bluegrass. Moreover, popular western musicians such as Paul Simon and Sting have featured traditional African musical influences in their recordings and performances, bringing about more recognition of the African musical heritage. These continent-spanning musical traditions are fascinating, and knowledge of them is essential for those wishing to hold an understanding of world music history.